The season started in January, collarbones have been snapped already. We’ve had racing in the Middle-East and the shores of the Mediterranean too. But this weekend marks the start of racing in Belgium and the intensity of the racing goes up and the quality of the road surface goes down. No more six star hotels or posing for photos with a koala, it’s back to winter, narrow lanes, mud and cobbles. On Saturday there was the Omloop Het Nieuwsblad and Sunday has Kuurne-Brussels-Kuurne. Here’s a preview with maps, profiles, favourites and info on TV schedules (updated after Saturday’s racing). Sometimes a race on the following day is labelled a “revenge race” because if a rider screws up on one day they can make amends the next. But K-B-K is not the same type of race. Instead it is more suited to sprinters and a bunch finish is likely. But not certain. Note the east-west aspect of the course, they start in Kuurne outside Kortrijk and head east towards Brussels before heading back. Clicking on the map above will give you the full detail. If the race is often for sprinters, it is certainly not flat. There’s the Kanarieberg (yes, as in canary bird) followed by the Oude Kwaremont, a loop into the French-speaking Walloon province for the Côte de Trieu and then two more climbs before the finish. André Greipel is my pick, he has been climbing well in Oman and has a full team at his service. Luckily the result is not certain and we’ll also see others. The full startsheet is here. Mark Cavendish is racing but can he cope with the climbs, I’m interested to see how he does. Boonen might be out for revenge, he won Gent-Wevelgem in 2011 with a powerful sprint so he can still beat the best in a sprint finish. Rabobank come with an in-form Matti Breschel and Mark Renshaw for the sprint, the team is slowly feeling the pressure of the media who expect a win. Tyler Farrar is back on familiar roads and close to win, for me he can sprint but has long been a capable classics rider. Greenedge have several sprinters, watch for Keukeleire and also breakaway specialist Svein Tuft. BMC could back young sprinter Adam Blythe and Katusha could do the same for Galimzyanov, both have come close to a result. 1t4i have Degenkolb to pass the climbs and sprint but I think he prefers slightly uphill finishes. One for a caption competition, no? 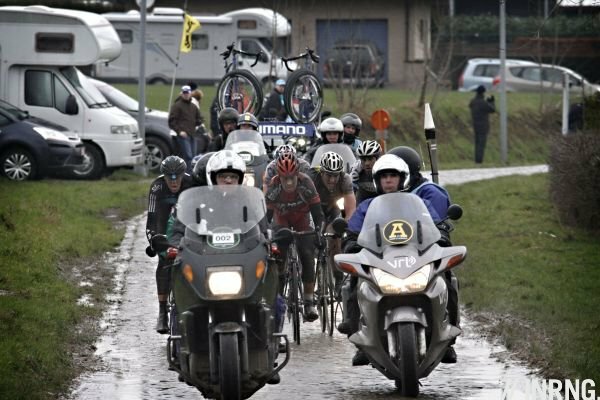 Whoever wins, Belgium can be an eccentric place and the inhabitants of Kuurne are known as donkeys. So look out for the donkeys on the podium, not real ones but soft toys. Sporza will be broadcasting from 2pm Euro time until 5.15pm. Saturday’s racing was unrestricted to visit Sporza.be and look for the “Live Match Center” links. Once again even if you don’t understand the Dutch, don’t be too afraid of the foreign language feed. Michel Wuyts was already doing his trademark “oy oy oy” and “oh la la la” sounds. Conditions for Sunday look similar to Saturday. Cool but dry and the wind will be even lighter. 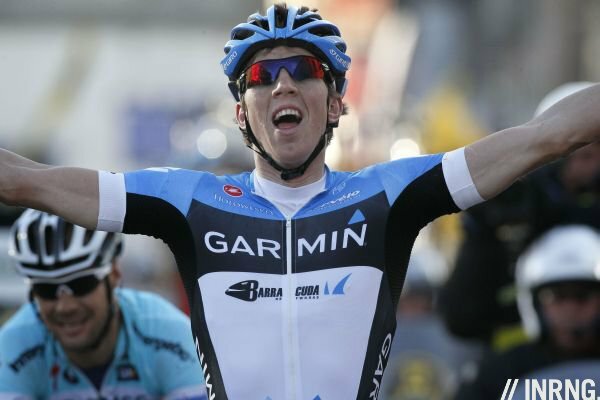 Congratulations to Sep Vanmarcke for his win. This was a powerful display of strength, ambition and tactics from the 23 year old Garmin-Barracuda rider. He made the select group with Boonen, Breschel, Flecha, Hushovd and more when the move went on the Taaienberg and in time he was the one who attacked to shrink the group to three riders (pictured), all this whilst up against numerical superiority from Omega Pharma-Quickstep and Sky. Boonen perhaps wasted too much energy early in the race but let’s make no mistake, Vanmarcke didn’t get lucky in the sprint, he took the right wheel and powered to the line, all this after covering the right moves, attacking and never missing a turn. He was second in Gent-Wevelgem last year. He can sprint. Omloop is Dutch for “circuit”, like “loop” and Het Nieuwsblad means “The News Sheet”, a newspaper with a 25% market share in the Dutch-speaking part of Belgium. The race used to be known as Het Volk but this newspaper was acquired by Het Nieuwsblad. Anyway, let’s get on with the race. Here is the profile, so typical of a race in Belgium with the concentration of cobbled climbs in the latter half of the race. Click on the profile image to enlarge it. The course is 200km long and features several cobbled climbs and flat sections of kasseien. The start and finish are in Gent, along with the 10 climbs and the nine flat cobbled sections, which include the Haaghoek three times. If you don’t know Belgium too well then the map might seem meaningless but wait a second. Look again and see how the race twists and turns and then remember the prevailing wind in Belgium comes from the North Sea to the west and heads east. So any time you see the race heading north or south this often means crosswinds but the forecast for the weekend is more gentle. There is no single selection point on the course rather it is a gradual process of elimination conducted via each climb along the route. With no climb during the last 35km, there is time for some regrouping as the race heads for the finish but on the condition that a few teams have missed the move up front and can organise a chase. Last year’s edition was a vintage race with a duel between Juan Antonio Flecha and Sebastien Langeveld with the weather as referee. Both riders rode themselves to exhaustion and sprinted side by side to the line. The video highlights clip is worth watching to see the action and also for the clear Flemish delivery. Even if you don’t speak a word of Dutch you can get the names of riders and soon other words jump out like Paadestraat, the place where Flecha went away and laaste kilometre. The language might seem impenetrable but with many classics coming up, if you want to watch them then there’s a good chance you’re doing it via an internet feed with the coverage from Belgium’s Sporza channel and in time you’ll assimilate some of the words. Take your pick, the startlist is online (PDF) and you can see the bookmakers at Oddschecker.com. With the climbs far from the finish and above all this being the opening race of the year, we don’t have too much to go on when it comes to measuring form. Tom Boonen stands out because of his wins, he can be a classics player and also win from a sprint. He’ll have support from Sylvain Chavanel, the French champion is in form now. Sky’s Flecha is a contender, his diesel power an advantage on the run in to the finish if he can slip the others. From the others I’m not going to name Gilbert. I think he came up a bit short in the Haut Var and like last year, he wants to be in form in April, not now. Plus have you seen his team? Ballan, Burghardt, Hushovd, Phinney, Quinziato, Schär and Van Avermaet, that’s a rock solid squad. By contrast Lotto-Belisol seem to be saving their best for Sunday (more below). Katusha have Paolini, a wily character for a podium finish. Rabobank come with Lars Boom, a father this week. Garmin-Barracuda look very strong, with Haussler for a sprint but workhorses like Vansummeren, Maaskant and the impressive Navardauskas, all with captaincy from Klier and Millar. The last Pro Tour team is Vacansoleil who often seem like the poor cousins but with Leukemans, Devolder, De Gendt and Marcato have a very strong chance. Amongst the Pro Conti teams we find Europcar with Thomas Voeckler, probably hunting for form ahead of Paris-Nice. Leif Hoste is back in Belgium with Accent Jobs-Willems Verandas. Cofidis have Adrien Petit, the 21 year old is as much a talent as Arnaud Demarre or Nacer Bouhanni. Project 1t4i, close to naming their sponsor for 2012, have De Kort and Degenkolb. Nothing epic like last year, the forecast suggests 9C (48F) and light winds from the northwest. The roads might be damp from the night before but the skies will have light cloud cover. Cyclingfans.com is your place for live feeds, see the link on the right of the page as ever. Don’t be afraid to listen in Flemish, you will quickly get the names from Michel Wuyts and guest José De Cauwer. TV coverage starts at 1.35pm Eurotime but images of the racing will probably start later after the studio intro. Great post Inner Ring! Thanks for this introduction. I agree with Greipel for KBK, but can’t think of an out and out favourite for OHN. As an Australian I hesitate to say this but these races signal the real start to the racing year for me. With the TDF contenders so closely husbanding their energies (the Legacy of Lance?) such early races are ripe for others to win. Greipel always seems to have early form and so I easily join you in tipping him. Let the season begin! Omloop to Liege, my favourite part of the year! Warmed up this arvo by watching 2010 OHN, 2010 and 2011 Strade Bianche. Why do I live in Australia!? Plenty of late nights in store! I personally feel that you have the most informative cycling website on the internet. I’ve followed Het Volk (can’t get the old name out of my head) for several years now and even talked my wife into driving through that part of Belgium while we were on vacation to to get a clearer picture. You summary has made it near crystal clear. I can’t wait for all the Classics to be in full swing and for more posts. FINALLY the real races get started! Sicily does not yet have RAI Sport 1 or 2 so the ‘net will be my only option to watch the action. I’ll make sure to start my Saturday morning ride early enough to get back to have lunch before things get going in earnest. A great weekend to all! I love listening to the announcers having spent this whole cross season glued to the laptop. Sporza cracks me up when they say oooooopppsss at a bobble. The guys at cycling.tv do a good job as well. They delivered english commentary over the same TV4 or Sporza feed. I just checked they have the season schedule up and Omloop and K B K are listed. I like what they do as you can watch the race post broadcast on demand. this will be my first full season with inrng as commentator. Can’t wait. simone: thanks, it’s fixed. I knew Sutton won (as with the photo) but wanted to go and check which classic it was Boonen took last year in a sprint finish… and forgot to come back and fix this. Great way to whet the appetite for the coming year. Very interested to see what Farrar does this year. I can see him following (trying to follow) the example of Boonen and focusing on the Classics. I cannot see him getting any chance in straight up sprints with Kittel, Cav and Greipel on form. Nice overview, my favourite part of the season finally starts. You’ve made one mistake though: The Côte de Trieu isn’t in France, but “only” in Wallonia – just so, it’s right at the border to Oost-Vlaanderen. It’s also known by its Flemish name of Knokteberg. I love how the Flemish only a have a few wee hills and sections of cobbled roads. And every race goes over these same bergs and pave sections umpteen times. But each race has its own character and feel, history & tradition. And interesting to listen to the news commentary in the Omloop clip, where they mention how the absence of race radio meant the Boonen group had no clue about the lead Langeveld and the chasers had. Great intro INRNG, I can’t wait!! lukascph: fixed, bedankt as they say in Flanders. It’s the most wonderful time of the year! And from now until the end of April, family and friends can find me screaming at a computer screen weekend mornings. And I love watching it in Flemish – don’t speak a word of it but the announcers are so good you just get it. Many thanks for the build-up, inrng. If your in Australia – sportsbet.com.au have odds on both races which is amazin. Its a shame they didnt put odds on for London Track World Cup. As always the INRNG has provided a very comprehensive analysis on the race!! Good race! The TV coverage was very good. I love to watch these races (sure glad I’m not IN them) as they dodge the parked cars, spectators and jump onto and off of the pavement or cobbles to improve their position. The winner was a deserving one as he did plenty of work throughout the period I watched. Did Mighty Thor just not have anything today? Maybe he (like Boonen) is still short of his best form, waiting for Paris-Roubaix, etc.? I hope tomorrow’s race is as entertaining AND as easily available as today’s was. Your comments and insights are great as always! I’m starting to count the days until we get on the plane to go up to see P-R for the first time live in-person. Did Barracuda not pay enough or do they reckon people will study the zippers? Rider Council: I was thinking the same, there has to be a way to print on the zippers to get the corporate logo just right. You can’t print on zippers! $50 carbon frames aren’t enough eh? Is BMC going to make amends today? What were the results for those of us unable too follow? maybe the sponsors are happy with the “zipper split”, the company was founded by Gary Burrell and Min Kao. They named their company after the first three letters of each first name.